Barcelona-born Carlos Ruiz Zafón’s debut novel, The Shadow of the Wind, was an international bestseller and something of a publishing phenomena. His follow-up, The Angel’s Game, was -- arguably -- one of the most important books published last year: out last week in a stunning paperback edition from Anchor Books. Ruiz Zafón’s lush and gothic brand of magic realism keeps readers wondering at the breaks between fantasy and reality. What is meant to be rock solid in a Ruiz Zafón novel? What is meant to be mythology? Or magic? Or something else, too ephemeral to touch? For book-lovers, though, this is especially heady territory. “A love letter to all things literary,” The Onion said when the book first came out. And I love this one from The Washington Post: “A dream from which it would be imprudent to wake.” Hoo yeah. In 1920s Barcelona, young hack novelist David Martin receives a compelling offer: the opportunity to write a book above and beyond anything that has come before. He is promised a fortune but that doesn’t even touch the possibilities: it is a book for which “people will live and die.” Though he initially refuses, he is ultimately worn down and sets to work on the book of a lifetime. More: the book of all lifetimes. The Angel’s Game is, in a way, more than the sum of its parts and even Barcelona is a mysterious and magical character. Zafón is the second most read Spanish author of all time (Cervantes gets the title) and it’s not difficult to see why. The Angel’s Game is intricate and intelligent, complicated yet human, magical yet somewhat grounded in reality. 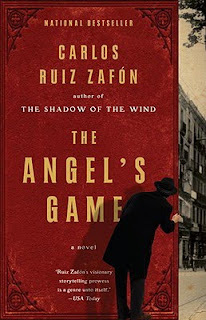 Those who loved The Shadow of the Wind should be warned, though: despite bits of connective tissue, The Angel’s Game is a much darker book. The writing is just as stunning, but the shadows you encounter have a substantial feel. Well said. Some people did not like this one compared to Shadow, but I thought it was lovely. It's part legend, part swashbuckling adventure, part dream. Happy Birthday to The Rap Sheet!